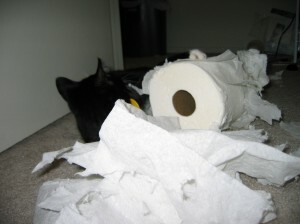 One of my cats, Mr. Knightley, likes to destroy toilet paper and eat plastic. That meant that I had to keep my bathroom door closed to keep him out of trouble. That was not great for ventilation after showers. For years, I looked for a solution that would protect the toilet paper and discourage him from eating the plastic lining of the trash can to no avail. I have finally found two things that helped me to make it safe to keep the bathroom door unattended. 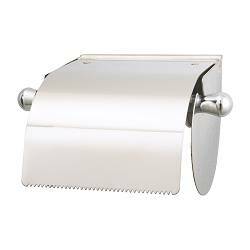 I bought a toilet roll holder from Ikea that had a cover. It was a great find since every other solution I had seen cost much more than the $10 I paid for that one. It was very easy to install, requiring just two screws. I found the trash can solution at Target. It is a round step can by simplehuman studio. The key feature is “smartbucket”, which prevents bag overhang. It was pricey for a trash can, but the peace of mind of mind that there is less plastic for my cat to find and eat makes it worth it. I am actually going to get another one today for another room in the apartment. I hope that information helps someone who has a cat as mischievous as mine. Your cat really is having fun eating those huh? My cat doesn’t like to get in the bathroom, lol. Cats and dogs are cute and great to have as a member of the family. It’s those times they want to act like naughty children that make you wonder. We once had a dog that tore our mattress to shreds. It was a huge mess, but Autumn was such a great dog otherwise. My cat find the entire bathroom exciting! Thanks so much for the post!…and what a great picture! !